Bangkok Airways saw its stock drop by 12% in the first day of trading on 3-Nov-2014 as it completed an initial public offering despite challenging market conditions. Bangkok Airways raised THB13 billion (USD400 million) as it sold 520,000 shares at THB25 (USD77 cents), but the share prices immediately dropped and ended the first day of trading at THB22 (USD68 cents). The lacklustre debut is likely more a reflection of the difficult conditions confronting the Southeast Asian airline sector rather than Bangkok Airways’ long-term outlook. Of the 11 publicly traded airlines in Southeast Asia, eight have seen their stock drop over the past year. Of the six which had IPOs since 2010, five are now trading below their IPO price. Overcapacity throughout Southeast Asia and political instability in Thailand has made conditions extremely challenging for all of the region’s carriers. But Bangkok Airways was one of only a few Southeast Asian airlines that was profitable 1H2014 and enjoys a strong niche due to a unique boutique full-service regional model that relies heavily on partnerships with foreign carriers. Bangkok Airways on 3-Nov-2014 became the fourth airline in Thailand that is traded on the Stock Exchange of Thailand. Thai Airways LCC affiliate Nok Air completed its IPO in Jul-2013 while Thai AirAsia parent Asia Aviation had its debut in May-2012. Flag carrier Thai Airways has been listed since 1991. Bangkok Airways is the smallest of Thailand’s four main airlines, accounting for about an 8% share of total seat capacity. Thai Airways, including its regional full-service subsidiary Thai Smile, accounts for a leading 26% share while Thai AirAsia accounts for about a 16% share and Nok a 10% share. 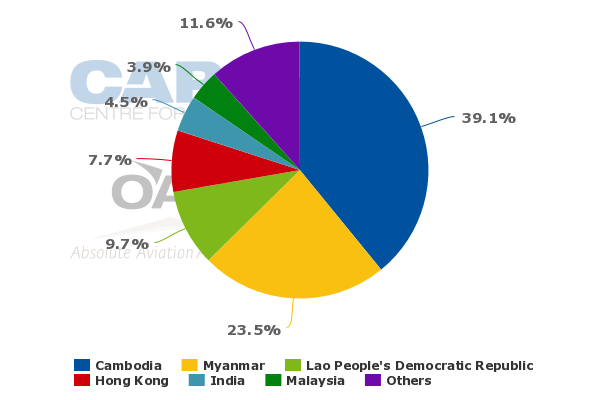 Several smaller Thai carriers including start-up Thai Lion Air account for about a 5% share of scheduled seat capacity, according to CAPA and OAG data. The AirAsia brand overall has about a 19% share of total seats in the Thai market when including Thai AirAsia, start-up Thai AirAsia X, Malaysia AirAsia and Indonesia AirAsia. On a revenue basis however Bangkok Airways is Thailand’s third largest airline company. Group revenues at the now publicly traded Bangkok Airways Public Company Limited were about USD675 million in 2013, putting it only slightly behind Thai AirAsia parent Asia Aviation which had USD765 million in revenues. The Thai Airways Group reported revenues of USD6.9 billion for 2013 while Nok, which has the largest domestic network in Thailand but only one international route, generated revenues of only USD368 million. Bangkok Airways has several non airline subsidiaries including in the ground handling, catering and airport sectors. It owns and operates the airport on the popular resort island of Samui, which accounts for about 30% of its total capacity, as well as much smaller airports at Sukhothai and Trat. Bangkok Airways currently serves 14 domestic and 13 international destinations with a fleet of 26 aircraft. Its primary hub is at Bangkok Suvarnabhumi (BKK) with Bangkok-Samui by far its largest route with as many as 20 daily flights during the peak season. But the carrier also operates four domestic and three international point to point routes from Samui (USM) and has a new mini-hub at Chiang Mai (CNX) in northern Thailand, where on 26-Oct-2014 it launched four new routes for a total of six (four domestic including Bangkok and two international). Phuket (HKT) is another important destination with up to eight daily flights from Bangkok and three point to point domestic routes. Bangkok Airways is heavily exposed to the Southeast Asian market, which could be a concern to some investors given the recent challenging conditions including overcapacity in the short-haul international market. Of its 13 international destinations nine are in Southeast Asia. The only exceptions are Dhaka in Bangladesh, Male in the Maldives, Mumbai in India and Hong Kong. Dhaka, Male and Mumbai are each served with only one daily flight from Bangkok while Hong Kong is served with two daily flights from Samui. Overall Southeast Asia accounts for about 80% of the carrier’s international seats. Bangkok Airways is also heavily exposed to the domestic Thai market, which also has been suffering from overcapacity this year due to rapid domestic expansion by Nok, Thai AirAsia and Thai Lion Air. About two-thirds of Bangkok Airways seat capacity is in the domestic market. Southeast Asian’s airline sector has generally been unprofitable so far this year, likely dampening investor confidence in a new listing. 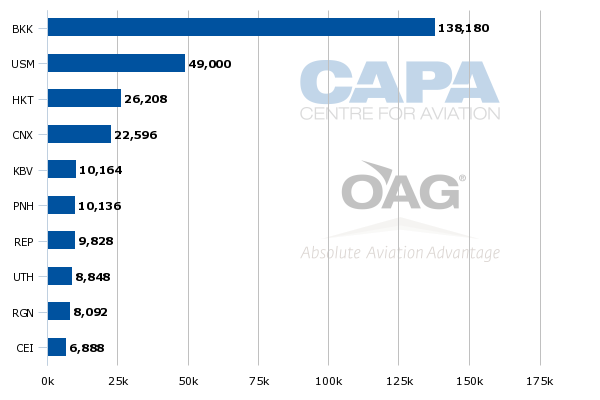 As CAPA previously analysed, only four of the 17 publicly traded airlines or subsidiaries in Southeast Asia were profitable on an operating basis in 1H2014 compared to 12 in 1H2013. Only one airline has so far reported figures for 3Q2014 (Tigerair Singapore with a USD25 million operating loss) but the sector overall was again likely in the red. Of the 11 airline stocks traded in Southeast Asia prior to Bangkok Airways’ debut, eight have posted share declines over the past year. The only exceptions are Cebu Pacific, Garuda Indonesia and Singapore Airlines. Garuda and SIA stock prices are up only slightly while Cebu Pacific is up 43% driven partially by industry leading profits in 2Q2014. As CAPA previously commented, Cebu Pacific has benefitted over the past year from consolidation and capacity reductions in its home market, the Philippines, while the rest of Southeast Asia has only started seeing some adjustments and more rational capacity levels in the past couple of months. Also working against Bangkok Airways is the recent post-IPO performance of new Southeast Asian airline stocks. Of the six airlines in Southeast Asia which have completed IPOs over the last five years, five are currently trading below their initial IPO price including recent strong performer Cebu Pacific. The only airline from this group which is currently trading above its IPO price is Thai AirAsia but it is trading 40% below its all time high (reached in Mar-2013) and has slipped 19% over the last 12 months. Bangkok Airways is obviously impacted by the generally challenging market conditions in Thailand and Southeast Asia. But the airline also has a unique niche that differentiates itself from the region’s other publicly traded airlines. Bangkok Airways follows a regional full-service model and does not have a budget subsidiary or unit. Of the six other Southeast Airlines which have completed IPOs this decade five are LCCs and one is a flag carrier with an LCC subsidiary. In the intensely competitive Thai domestic market Bangkok Airways does compete for local traffic on some routes. But about 37% of its domestic capacity is on routes from Samui where there is no LCC competition. The prospect of LCC competition at Samui is slim as the airport is owned by Bangkok Airways and movements are capped because of environmental concerns. Another 5% of Bangkok Airways' domestic capacity is allocated to the other airports it owns, Sukhothai and Trat, where there is no competition whatsoever. Bangkok Airways also operates at Suvarnabhumi while all of Thailand’s LCCs now operate from the old airport Don Mueang. Don Mueang has some advantages as it is closer to most of Bangkok’s population. But a large volume of domestic traffic in Thailand connects to international flights, which, with the exception of some regional LCC flights, are at Suvarnabhumi. With Thailand’s three main LCCs now operating at Don Mueang it makes it hard for these carriers to pursue connections with full-service carriers. Bangkok Airways has traditionally worked with most foreign airlines serving Bangkok that are not in the Star Alliance. It even works with a few Star carriers and could potentially start partnering more because the recent shift of most domestic flights by Thai Airways regional subsidiary Thai Smile from Suvarnabhumi to Don Mueang has handed Bangkok Airways an even larger share of the domestic market at Suvarnabhumi. Bangkok Airways currently has 14 codeshare partners, five of which have been added since the beginning of 2013 and 10 of which are from outside Asia. Aeroflot is its most recent addition with codeshare flights launched at the end of Sep-2014. Interline arrangements generate even bigger volumes, led by Emirates. Bangkok Airways’ traditional source of interline and codeshare passengers have come from European carriers but in recent years the growth has been generated by new partners in the Middle East, Australia and Asia. As CAPA previously outlined, almost 10% of the carrier’s total passenger traffic now come from the big three Gulf carriers. Cambodia, Myanmar and Laos are particularly important – and generally profitable – international markets for Bangkok Airways. Bangkok Airways is the second largest foreign carrier in Cambodia and Myanmar and the third largest in Laos based on current seat capacity data. It currently serves three destinations in Myanmar, two in Cambodia and two in Laos. Phnom Penh and Siem Reap in Cambodia are the carrier's two largest international destinations with five daily flights each while Yangon in Myanmar is the third largest international destination with 32 weekly flights. These markets are relatively small but are growing and are increasingly important offline destinations for several non-Asian carriers. Myanmar and Cambodia were two of the fastest growing markets in Asia in 2013, with international passenger traffic increasing by 32% and 18% respectively. But they are still not big enough to attract non-stop long-haul services, enabling Bangkok Airways to continue expanding in two markets which already account for over 60% of its international seat capacity. Another strength of Bangkok Airways’ domestic and regional international network is its ability to provide visitors to Thailand (and the airlines that fly them to Thailand) alternatives to Bangkok during periods the capital is not seen as an attractive tourist destination. While some tourists were not comfortable visiting Bangkok in 1H2014 due to a prolonged period of civil unrest, other destinations in Thailand (as well as in neighbouring countries) were not impacted. Of the four largest Thailand-based airlines, only Bangkok Airways was profitable in 1H2014. The company reported an operating profit of THB843 million (USD26 million) in 1H2014. This was roughly half the THB1.67 billion operating profit (USD56 million) from 1H2013 but still compares favourable to competitors. Thai AirAsia had a roughly break-even result in 1H2014 while Nok Air and Thai Airways both incurred losses. Bangkok Airways also outperformed all its competitors from an operating margin perspective in 2012 and 2013. Bangkok Airways had an operating profit margin of 12% in 2013 and almost 20% in 2012. Bangkok Airways' revenue growth, which was only 6% in 2013 and 7% in 1H2014, has been much slower than Nok or Thai AirAsia. But the top line figures are respectable for a full-service carrier and should grow faster as Bangkok Airways starts to use the proceeds of its IPO to accelerate expansion. The company has said the IPO proceeds will be used to acquire new aircraft – both replacements and growth – as well as upgrade Samui Airport and construct a maintenance hangar at Suvarnabhumi. New-generation narrowbody aircraft, most likely the A320neo, are expected to be purchased. Bangkok Airways has already ordered nine ATR 72-600s to replace its current turboprop fleet of eight ATR 72-500s. A small number of additional turboprop orders are possible as Bangkok Airways pursues opportunities to open short and thin point to point routes such as the recently launched Chiang Mai to Udon Thani, Yangon and Mandalay services. The IPO should usher in a new period of growth and also significantly raise the airline’s profile. Bangkok Airways has been a quiet family owned airline since it was established 46 years ago. Capt Puttipong Prasarttong-Osoth, who serves as the airline’s president, and his family retain a 72% share. The timing of Bangkok Airways’ IPO is far from ideal given the extremely challenging conditions in the Thai and broader Southeast Asian markets. But the fact the airline was still able to complete the IPO, which is the biggest in Thailand so far this year, is a testament to its overall strong position in a market that should again see rapid growth once fully recovered.